Designing a custom glass aquarium is pretty straightforward. It is a matter of selecting the size of the aquarium and the glass thickness to be used, then put it all together to ​build your DIY aquarium. Just follow the steps, one at a time, and you will be surprised at how easy it really is. You will need measuring tape for this design process. Determine the "footprint" (front to back, side to side measurement) of the tank. To a great extent, the footprint will be determined by the final location of the tank and the stand that it will rest upon. Make a note of the tank footprint measurements. In order to determine the size of the side glass panels, you will first need to determine the thickness of the glass you will be using. Note that the side pieces are set inside the front and back panels, and their dimensions are determined after you choose the glass thickness. Refer to the chart to help you determine this. This chart is based on single strength glass, as opposed to tempered or "safety" glass. Single strength glass is what you see in most aquariums as well as the windows in your house. It can be cut to whatever size you wish and the sharp edges can be ground smooth to avoid injuries. Find the length of the tank in the top row, then follow that column down until you reach the height of the tank. Glass thickness is indicated in millimeters (mm), with the number in parenthesis below it indicating the safety factor. To help you choose between thicknesses, aim for the thickness that has a factor of 3.8 or greater. Warren Stilwell explains the safety factor on the Federation of New Zealand Aquatic Societies website. A factor of 3.8 is used to account for the variability of the strength of glass due to the manufacturing process. He notes that the joining compound (commonly silicone) should be at least 0.5 to 1 mm thick to allow for any irregularities along the edge of the glass. The edges must be ground or they will not be flat. If you want to use a thinner glass to keep your costs down and still maintain an acceptable safety factor, you can simply design your tank as if it were two tanks by installing a front-to-back brace across the top/center of the tank. This effectively turns a 4-foot long tank into two 2-foot long tanks. To demonstrate this idea, look at the 21-inch high, 4-foot wide tank line in the chart. It indicates that using 9 mm glass will give you a safety factor of 2.92. However, if you use a front to back brace, structurally turning the tank into two 2-foot wide tanks, it increases the safety factor to 4.1, which is a very satisfactory safety factor. If the side panels are no more than 2 feet, they will also have a safety factor of 4.1. If you want to have a flat-topped tank, you can install (silicone) the brace between the front and back panels, level with the top of the tank. Three inches would be a good width for the brace, but if you are going to install a glass canopy on the tank, adjust the brace width to accommodate the canopy. If you want more strength in the center of the tank, you can use two narrower braces siliconed together. Once you have determined the thickness of the glass you will be using for the front and back panels, calculating the width of the side panels is simple. Double the width of the glass and subtract that number from the front to back measurement of the bottom panel. Example: If the front-to-back measurement of the bottom panel is 18 inches and you are using 1/4-inch glass, your side panel width would be 17 1/2 inches. The adhesive (usually silicone) used to bond the glass panels together fails to adhere to one or more of the glass panels. The structural integrity of the glass is destroyed (it breaks). Use the appropriate high-quality silicone. Clean the bonding surfaces with acetone before applying the silicone. Fit the glass panels together with a minimum gap between the panels (essentially glass-to-glass contact). Assemble the glass panels promptly after applying the silicone. Impact from a foreign object. A scratch or chip reduces the strength of the glass. The top of the glass panel bends beyond its breaking point. Prevent the first two causes by avoiding striking the tank and scratching or chipping it. Preventing glass in an aquarium from bending to the breaking point is pretty simple, too. The glass at the bottom and sides of the aquarium can't bend if the silicone adheres to the glass. 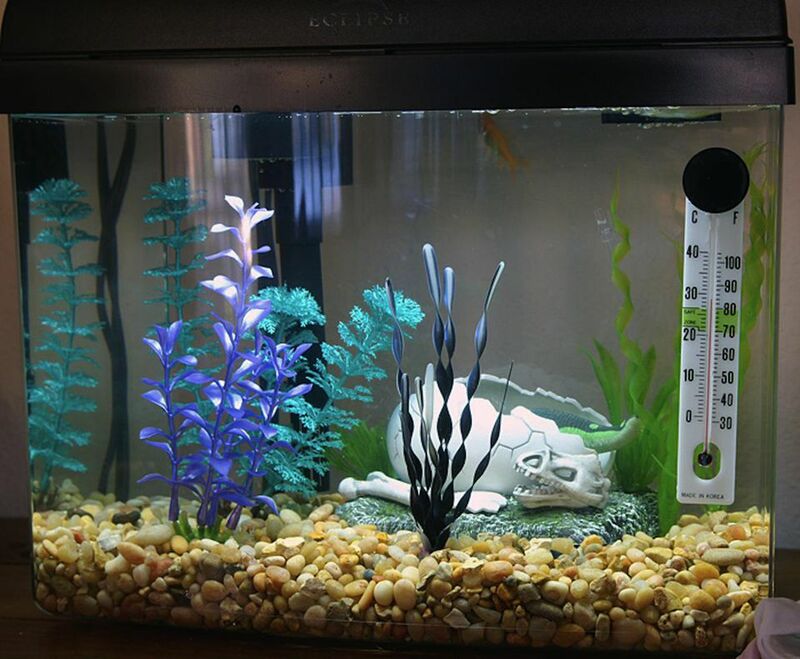 The normal place for aquarium glass to bend is at the top edges of the front and back panels. The thicker the glass is, the more pressure it can take without bending, or you can simply brace the top edges to keep them from bending. 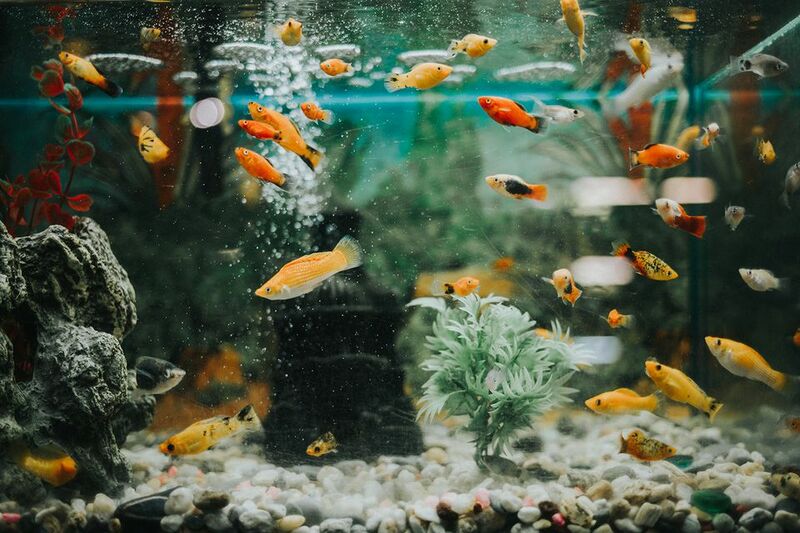 Many of the manufactured glass aquariums you see on the market employ plastic or metal bracing around the top of the tank as well as a piece across the center. This allows them to use a thinner (read: cheaper) glass and also provide a bracket to hold glass canopies. Many of the manufacturers will also use angle plastic or metal along the bottom and sides. This can be for cosmetic effect (looks) or to help hold the joints together. Now that you have the dimensions and the glass thickness selected, your aquarium design is ready to implement.